The technology surrounding landscape lighting is changing. Innovations are hitting the market all the time – increased efficiency, lower costs, and longer lifespans. While low-voltage lighting is not new, per se, it does offer its own unique benefits and advancements. For example, as a business, you’re most likely searching for a cost-effective lighting solution. Commercial low-voltage lighting will save you money, increase value, and provide safety and security for your clients. Before deciding, it’s important to inform yourself. Designing a landscape lighting system for a commercial property is vastly different from a residential setting. Commercial systems are typically designed for customers, more so than the business. Your customers need to see the sidewalk, steps, parking lot, and lawn. Without proper lighting, someone could slip and fall. When designing the system, the technician needs to account for electrical power and voltage fluctuations. Currently, the most used lighting system utilizes 12-volt low voltage, since the conventional system is unable to meet the commercial requirement. A low-voltage system uses smaller sources of light. You won’t even require major renovations to your landscape or building. Like a homeowner, you have the opportunity to select which lighting fixtures you want for your landscape. Not being selective may lead to numerous complications down the road. You must understand that not all light fixtures are designed using the same level of quality or materials. For example, a plastic or aluminum fixture will fade and crack over time. The material will also allow moisture into the electrical system. When it comes to a commercial system, do not skimp. You pay for what you get. For commercial landscape lighting, contact Blooms Landcare by calling (817) 688-5352. 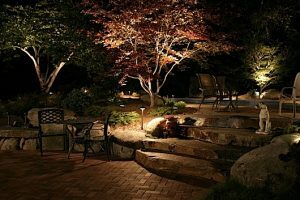 We’ll discuss proper lighting solutions for your business to ensure customers find your landscape appealing. Just give us a call today!